This is a majority of the picks I own right now. On top is the 32 piece set from SouthOrd along with some homemade wrenches. Beneath that is the competition set from the home brew competition on LP101 with the exception of the top wrench and the pick with the white handle which is from the southord set an has an unfinished sculpey handle. The three black handled ones that look like a set are the 3 thrown in buy Legion303 since his entry in the competition was his old handle style. This is what came in the competition set package along with the 3 picks from Legion303. From left to right they were made by: Ratyoke, Cheesehead, Criminalhate, Legion303, LockNewbie21, Brianpojo, Toolymcgee. 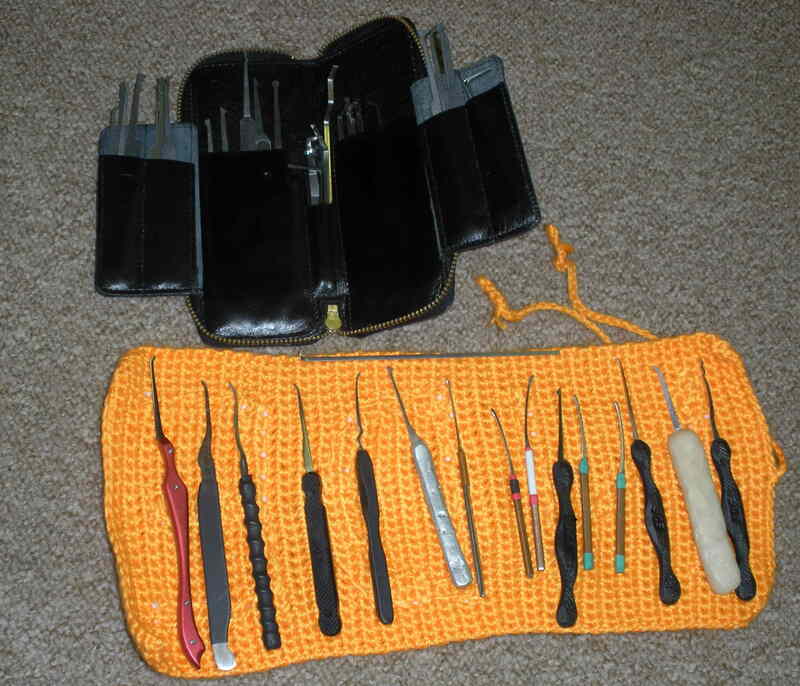 The 4 picks on the end are wirewound picks that were sent in by one of the contestants (by the lock alone I am thinking Toolymcgee but I am not sureThe knit pick case says NDE on the other side and was made by Schulyer's grandmother for this pickset. All of the pictures below which are on the knit case are of this set. For more information about this pick set click here.